Congrats to our media colleagues! 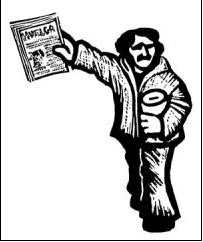 Local news media including the East Bay Express, SF Weekly, and the San Francisco Bay Guardian won awards in eight categories at the annual Association of Alternative News Media convention in Nashville last weekend. Seventy-seven publications from across the US and Canada entered more than 900 pieces for evaluation in categories ranging from music criticism and design to beat reporting and long-form news. The East Bay Express was particularly successful, taking first and second place for Long Form News, second place for Economic Inequality Reporting, third place for Arts Feature, and third place in Beat Reporting and Music Criticism for publications with a circulation of less than 50,000. See below for links to the award-winning materials from the Bay Area. SFBG won “cover design” award?